Good mornings are a really effective exercise that most people don’t do. They target the larger posterior chain muscles (glutes, hamstrings, and paraspinals), which can help you improve your strength in lifts like the deadlift and squat, as well as decrease your risk of lower-back injury. 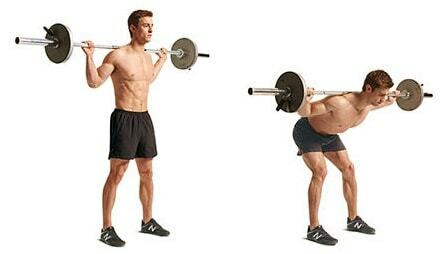 Stand with feet hip- to shoulder-width apart, holding a relatively light barbell across your upper traps. Keeping your back flat and knees slightly bent , slowly bend your hips back to lower your torso toward the floor. When your torso reaches parallel with the floor, reverse the motion to return to the standing position. Want to get after these nine great exercises all at once? Try this upper-body/lower-body two-day split for a full-body blitz your muscles will never see coming.